Home / Why Buy Snuggy Boots? Dogs of all ages can benefit from the Snuggy Boots Suspender System. Our patented “doggie suspenders” were originally created out of a need to help a special Sheltie named Snickers. Since then, they’ve helped hundreds of dog lovers like you. 1—To protect the paw pads – If your pet hasn’t experienced a ripped or blistered paw pad before, you may not have given much thought to them. After all, they seem tough, right? Yet, your pet’s paw pads are full of nerves and blood vessels which is why a cut paw pad can bleed so much. Since dogs walk around in their “bare feet” so to speak, there are ample opportunities for them to experience pain. The outdoors has sharp rocks, stray broken glass and hot asphalt in the summer. Each of these poses potential hazards. Some of our customers use the Snuggy Boots Suspender System to protect their pet’s paws when they’re hiking. If you’re not a hiker but you live in an area with hot summers, you know how hot pavement can get. One of the biggest sources of burned or blistered paws pads are sizzling sidewalks or asphalt. These can heat up to a 100 degrees or more and that can’t be good for your pet’s paws. Walk them in the grass instead or protect their paws with booties. 2—For dogs with arthritis, hip dysplasia and other mobility issues – the elastic straps support your pet’s joints. 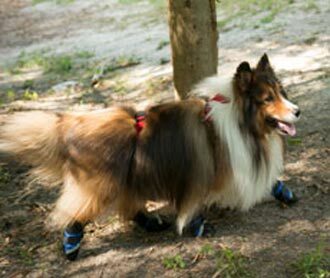 In fact, they can “lean into” the straps and they give your pet’s legs a little “lift” as they walk. That’s what happened to Snickers. As he recovered from a terrible medical situation, his rear legs lost a lot of their mobility. The doctors recommended frequent walks to strengthen them but that was difficult for him. The Snuggy Boots Suspender System gave him the support he needed to make walking easier so he could regain his strength. Many of our customers like our “doggie suspenders” because it helps their dog with arthritis or hip dysplasia. Here’s how it works. Each elastic leg strap applies its compressive tension on each leg joint from the ankle to the hip joint. There is an equal tension coming down from the top. This places the entire leg in compression which helps to flex each joint and make the walking process more effortless and less painful. The front and rear buckles on the back strap can be adjusted to rest at any position over the rear leg hips or front leg shoulders to control the tension. Once you’ve adjusted the straps properly, you’ll find your pet can walk further, faster. 3—Gaining traction on slippery floors—If your dog slips and slides on your wooden or tile floor you may have tried traction socks. If so, you’ve quickly discovered they are hard to keep in place. Then it’s our “doggie suspenders” to the rescue. They connect quickly to the traction socks and keep them in place so your best friend can maintain his footing on slippery floors. Paw pads are more vulnerable than they appear. In fact, paw pad problems are one of the biggest reasons for emergency vet visits. Don’t let your dog become a statstic. Protect your pet’s paws.